I am a sucker for the award ceremonies and tonight kicks it all off with the 72nd Golden Globe Awards! 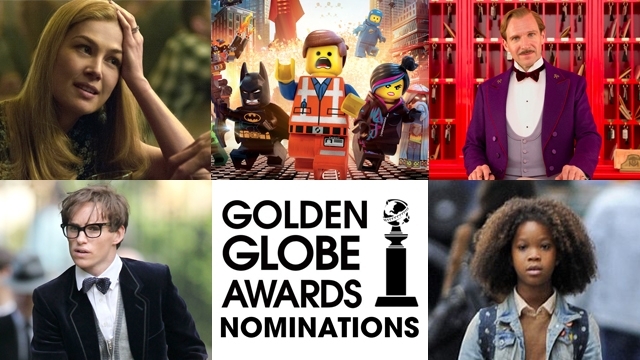 Hosted by Tina Fey and Amy Poehler for the third and final time, this year is going to be another exciting one, with some excellent films being nominated: Birdman (7 nominations), Boyhood (5 nominations), The Imitation Game (5 nominations), The Theory of Everything (4 nominations) and Gone Girl (4 nominations). I think Birdman and Boyhood will very much steal the show here and set the tone for the awards season to come. But I thought I’d talk about some nominations, predictions on who will win and give my opinion on who I would want to win. Feel free to comment your own opinions too! Who I’d like to win? – If Rosamund Pike doesn’t win, I’ll eat my sock! Who I’d like to win? – Hmmm.. Benedict Cumberbatch. Although all deserve it, and Eddie Redmayne surprised me so much in The Theory of Everything. And Steve Carell: wow! Who I’d like to win? – Genuinely don’t mind as long as it’s not Meryl Streep!! Who I’d like to win? Probably Birdman. But perhaps Pride, as it would show that mainstream cinema has matured since Brokeback Mountain. But the fact that the American DVD cover has been removed of any homosexual references is possibly hinting at a no. Who I’d like to win? – Again, I don’t really mind. I haven’t watched Maps to the Stars, however I’m often seeing that Julianne Moore was fantastic! Although I love them, I struggle to watch the Globes and the Oscars because America’s Los Angeles is 8 hours behind Britain, and NBC’s coverage is difficult to access here. That being said, I always try to watch it… And always fail. Also, apologies for the so many tags, I tried to limit it to the names of films and anyone I mentioned, rather than every single name on the list. What do you guys think about the Golden Globe Awards and my predictions/opinion? A film that starts with the words “based on a true story”, more often than not, are some of the best films ever made and remain some of my favourites. 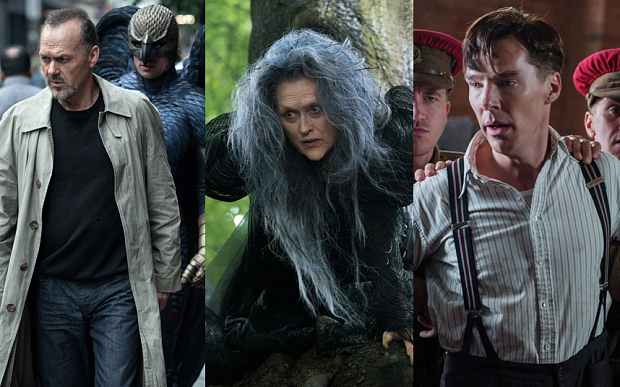 Wartime thriller ‘The Imitation Game’ has now been added to that list and will resonate with me for a while. 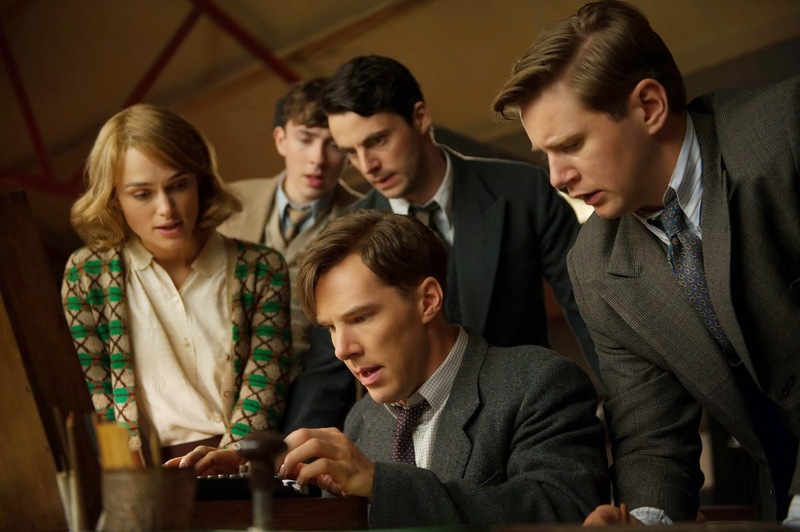 ‘The Imitation Game’ focuses on the British mathematician, cryptologist and utter genius Alan Turing (Benedict Cumberbatch) and his team of code-breakers (Keira Knightley and Matthew Goode included) who, in the darkest days World War II, were racing against time to crack the impossible German Code ‘Enigma’ that helped the Allies win the war. Not only setting it during his code-breaking days, it also takes a more personal touch: his teenage years, his prosecution for homosexual acts and his awful treatment afterwards. Chronologically, the film may have been boring and not half as clever as it was. But instead it wove in and out of these different time periods making it an interesting watch. I liked the fact that writer Graham Moore included this character exposition and backstory. It made Alan Turing human, something that maybe his colleagues and others didn’t think he was. Many probably perceived him like one of the machines that he wrote about or wanted to create, yet at heart, he was just different living in a time where different was not accepted easily. It seems he was only truly ‘accepted’ a year ago, when he was granted a posthumous royal pardon for ‘gross indecency’. This man is remarkable, did so much for our country and changed the course of history, so why did it take so long? It is a true injustice. Please don’t mistake what I’ve said so far to mean this is a sad film, really it’s not. It is an engrossing thriller, it is ‘feel good’, and really shows Turing’s achievements, as well as our country’s achievements fighting in the war. No words can describe how in awe of Benedict Cumberbatch I am and as Alan Turing, he was mesmerising and captivating, presenting the complex Turing as the biggest code to break of all. He was also heart-breaking, and his poignant portrayal made me cry. Keira Knightley is warm and calming as Joan Clarke, the only woman on the team. Forget how ever so posh she is, she is Alan’s only vice sometimes and seems to be the only person to understand him. She is subject to prejudice herself in the film; as a lady, she is different too and not meant for intellectual things it seems and is expected to take a husband and live out her days. Matthew Goode is equally as charming as Hugh Alexander. And Charles Dance, Mark Strong and Rory Kinnear are a welcome addition to the cast. This is the best film I’ve seen in 2014 so far and no doubt it’ll be nominated for a few at the Oscars. “Are you paying attention?” Alan Turing asks you and, honestly, ‘The Imitation Game’ will really grab your attention. ‘The Imitation Game’ is in cinemas now! Three words to sum up the day: People, Rain and Pigeons! 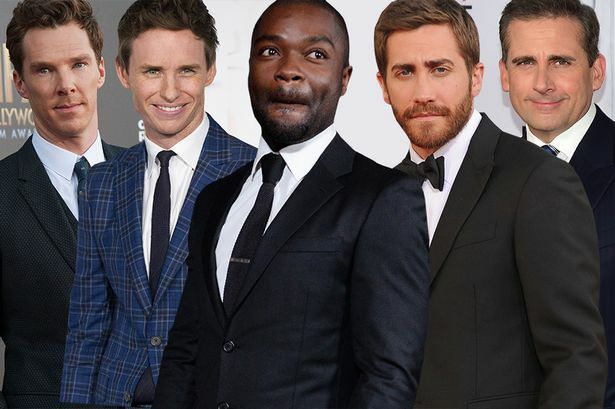 ‘The Imitation Game’ focuses on the British genius Alan Turing and his team of code-breakers who, in the darkest days World War II, were racing against time to to crack the German Enigma Code that helped the Allies win the war. It also looks into the life of Alan Turing: his teenage years, his prosecution for homosexual acts and his awful treatment afterwards. This is a film I’m hugely excited about; the trailer blew me away, it’s dramatic, it’s a period drama and the main star is Benedict Cumberbatch. He is an incredible actor and is someone I’m quite in awe of. 1. They are unfair. It doesn’t matter if you’ve been waiting for hours and hours, when it comes to the actual event, there will be someone there who only turns up 5 minutes before, gets through the barriers, has no idea what it’s all for but still manages to get a better spot/pictures than you. 2. There will be people there who just see celebrities as a piece of meat. They don’t actually care about the film, it’s credentials or the people who made it, they just want pictures and autographs of the stars to show off and/or sell. 3. Those people will get on your nerves. They will make comments like “no-one cares about the Director! Why does anyone want to speak to him?” Refrain from hitting them. Anyway, negative moment over because Premieres are actually really fun and no matter where you are, when the action starts, it is genuinely exciting to see the stars, the crew and how the film industry and media works right in front of your eyes! Unfortunately when the event did start, it poured down with rain, which, understandably, makes it really difficult to sign, pose and speak to fans. Keira Knightley was the first to arrive in a stunning gold dress, then many crew members like Director Mortem Tyldum and screenwriter Graham Moore, then other cast like Charles Dance, Mark Strong and Allen Leech arrived looking very dapper. Then the dashing Benedict himself arrived, and of course the crowds went crazy. Many of the stars didn’t really come over to the fans off of the red carpet, but Benedict Cumberbatch made a valiant effort, despite the awful weather, which I thought was extremely decent of him. During an interview when the interviewer told him the fans loved him, he looked overwhelmed and replied with: “I love you all too of course, and I’d just like to say, thank you all so much for coming down to today, standing around for hours in the cold and rain just to support us. I’m sorry that any autographs are soggy and I’m sorry I couldn’t come to everyone and I’m sorry that I couldn’t pose for your selfies and any photos because of this weather, but I adore you all and thank you.” Or something roughly along those lines, but whatever wording he used, I thought it was brilliant of him to recognise us and showed his character that he truly is a gentleman. Apologies for rambling on. But despite the classic British weather for this classic British tale, it was a highly entertaining day and recommend everyone does it! I will post up some photos, most of them awful I’m afraid and it will be the case of “Spot the Star.” I will also post the trailer up too, as I believe everyone should go and see this film! ‘The Imitation Game’ will be released in the UK on 14th November 2014, a week before it’s US release on the 21st November. My tablet became overwhelmed at Benedict’s beauty so went blurry..